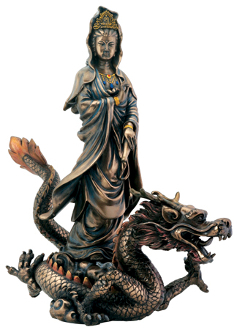 Kuan Yin, whose name roughly translates to 'she who hears the cries of the world', is the East Asian goddess of compassion and mercy. In Chinese Buddhism, Guan Yin is synonymous with the Bodhisattva Avalokitesvara, the pinnacle of mercy, compassion, kindness and love. (Bodhisattva- being of bodhi or enlightenment, one who has earned to leave the world of suffering and is destined to become a Buddha, but has forgone the bliss of nirvana with a vow to save all children of god. Avalojkitesvara (Sanskrit: अवलोकितेश्वर): The word ‘avalokita’ means "seeing or gazing down" and ‘Êvara’ means "lord" in Sanskrit). Beautifully recreated in a bronzed finish resin, L: 12" x W: 6.25" x H: 12.75".